What good is digital advertising if you can't measure it? Websites and mobile sites should have clearly defined goals and each of those goals need to be measured to help optimize your marketing efforts. Web analytics provides a wealth of information that can be very effective in planning marketing strategy, search engine optimization campaigns and even Website design. 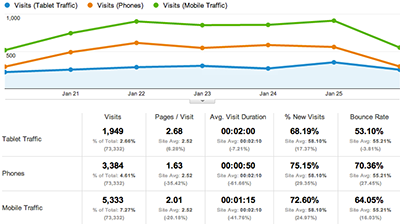 How can Click Marketing help you with Web Analytics? Click Marketing helps develop and implement a strong digital measurement strategy across all digital channels.